The rumors were true: Fortnite was not only announced for Switch this morning, it was downloadable immediately. Beginning at 10 AM Pacific, Nintendo’s handheld became host to 2018’s hottest battle royale brouhaha. So what’s the caveat in the title about? Well, there’s nothing wrong with the game itself. It plays just like it does on other machines, both on the TV and in handheld mode. For once, a problem with a popular game on a Nintendo device isn’t Nintendo’s fault. For this one, you can blame Sony. Here’s the issue. As the Fortnite developers stated on the Nintendo Treehouse broadcast today, Fortnite on Switch features cross-play with XBox One, PC and mobile phones. Notice which console is left out. Yup, Sony is pulling the same thing with Nintendo that they did with the others, but it goes beyond that now. 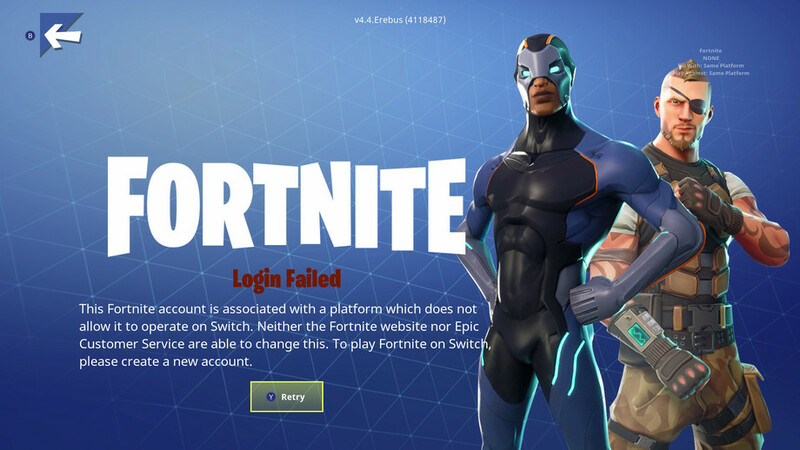 As gamers attempted to log in, they discovered their Fortnite accounts WOULDN’T WORK if they were made on the PS4. So if you’ve been Fortniting on Playstation, not only can you not cross-play with other consoles, you can’t even transfer your progress. It’s stuck on the PS4! We’ll let you know if Sony decides this is worth fixing. They haven’t budged in the past, but social media is rapidly filling up with complaints and most of them are directed at the PS4’s maker.